Do you spend too much time overseeing your e<earning programs and supporting students? Are completion rates lower than you hoped? Do you worry that your one-size-fits-all courses only meet the needs of some of your students? They’re questions that every eLearning site owner and facilitator wrestles with. You want students to have a positive learning experience and benefit from the training, but your resources are limited and you need to focus on where you can add the most value. What you create doesn’t always work for everyone, so you end up spending countless hours poring over LearnDash reports and sending follow-up emails. And even those tend to go out later than needed and not deliver the impact you hoped. There is a better way, and it’s by using automation on your LearnDash site. Solving the resource problem—maximizing learning outcomes and engagement with minimum time and cost—was one of the main reasons we built Uncanny Automator. It’s one of several tools we’ll explore here that make it make it easy to add automated workflows to your eLearning programs. In this article, we’ll look at 15 easy automation ideas you can add to your LearnDash sites in minutes that help to deliver a personalized learning experience, better learner engagement, more sales, improved knowledge transfer and better course analytics. After applying some of the automations in this article, you’ll end up with better courses and more revenue with minimal effort and cost. Creating personalized learning experiences can help to deliver improved student satisfaction, higher completion rates and better knowledge transfer. Not everyone learns the same way, and it’s important to give learners both control over the learning and the right learning interventions at the right time. With automation, a few simple recipes make it easy to support weaker learners, keep advanced learners from getting bored and provide alternatives to students that need them. 1. Let advanced users skip ahead. If users demonstrate mastery of a subject in a pre-test, why not let them skip the rest of the course? You could just autocomplete LearnDash lessons in a course that were covered by the pretest materials, or you might autocomplete that course entirely. Enrolling the user in a remedial course automatically. Sending the student an email with suggested learning activities. Adding users to a study group via BuddyPress. Notifying the user’s manager or instructor so personal intervention, like coaching, can be offered. 3. Incorporate personalized content. Contrary to what you might think at a glance, every LearnDash lesson and topic doesn’t have to be the same for every user. It’s easy to add user or group-specific variations to your courses—as long as you have the right tools. Users of Uncanny Owl’s Pro Toolkit can use LearnDash Group shortcodes to show content just to users of particular groups, and with membership plugins or CRM integrations, you can show content to users with a particular level or tag. Remedial users might see an extra video or download, or maybe users you’ve tagged as benefiting from auditory resources are offered an audio recording of the lesson. Interventions like these help learners receive the most suitable experience for their learning needs, all without facilitators having to get involved during the course. 4. 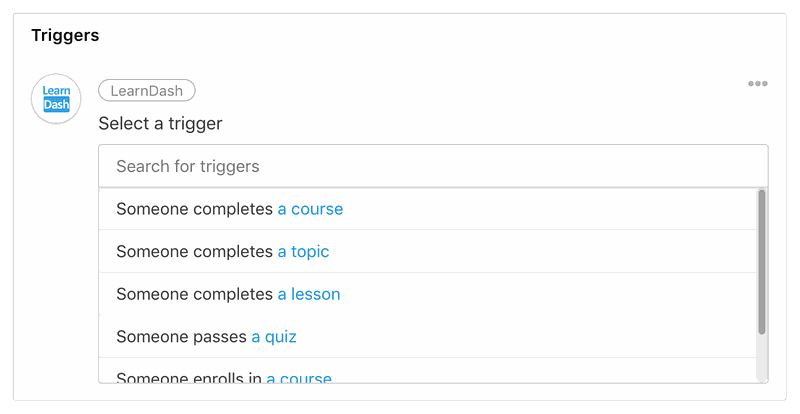 Give users more control over their learning experience. With automation tools and more learner-facing controls in the front end, it’s easy to give users more choice about how they learn. 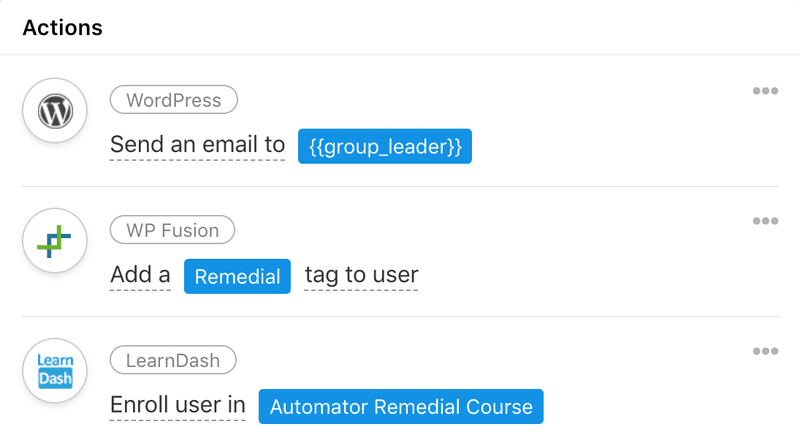 With Uncanny Automator, you might create recipes that add buttons throughout your courses that let users skip ahead by autocompleting lessons, reset course progress to get extra practice, trigger an email to a Group Leader for assistance, self-enroll into additional courses, etc. 5. Celebrate Learner Accomplishments. Self-directed programs can sometimes make the learner feel like they’re on their own, making it easier for them to lose interest and even stop the course altogether. Gamification is an easy way to reward progress and achievement, and with Uncanny Automator, this can become even more powerful. Besides awarding a badge with a plugin like GamiPress, you might send a congratulatory email from the instructor automatically, notify the learner’s manager, even send a tweet from the organization’s Twitter account with a congratulations message. To make congratulations emails more natural, leverage a CRM to tag the user based on a specific condition (like scoring over 80% on a final exam) and then send the email the next business day during working hours so that to the user it feels less scripted. 6. Add users to a study group for peer collaboration. Use learning metrics to add users to an appropriate study group and encourage students to get involved with the community. Maybe if a user scores 50% or lower on a course-pretest they’re added to a remedial group, and 90% or higher they’re added to an advanced group. This action might be combined with a series of dripped emails outlining how to participate in the community and encouraging involvement. 7. Check in on incomplete courses. Not all automations have to be triggered by something; it’s also extremely useful to trigger automations when something doesn’t happen. These types of automations are easier to set up with the help of a CRM and plugin like WP Fusion. These types of automations might send the user an email after a tag has been set indicating the user has access to a course but X days later does not have a tag confirming the user completed the course. They might also trigger interventions if a user hasn’t visited the site for several days or the user has viewed a lesson but hasn’t completed it. Certainly not every eLearning site is revenue-driven, but for ones that are, it’s easy to build in simple automations that increase sales opportunities. 8. Recommend products on course completion. One of your users just completed a course; what should they do next? Instead of leaving them guessing, you can send them an email with a product recommendation. If you use a CRM you can even make this recommendation based on previous purchases and course completions (you don’t want to recommend a course someone has already purchased or completed). 9. Offer upsells that fit the learner’s needs. Is a student consistently showing poor quiz performance? Suggest some private coaching sessions. Does a course evaluation form suggest interest in a particular topic area? Suggest a deeper dive in a more advanced class. More advanced behavior tracking through automations and CRMs means you can make better product recommendations, and better time the recommendations for when the user most needs them (and is most likely to buy). 10. Create certification programs. 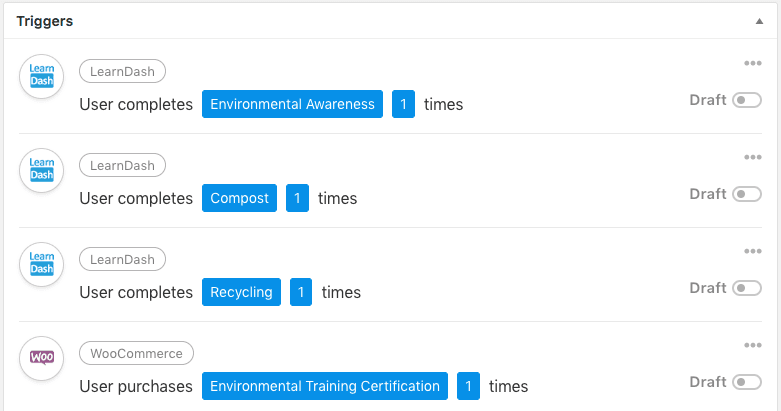 LearnDash on its own doesn’t support certification programs, but they can be a great way to encourage users to complete or purchase extra courses in order to be “certified” in a particular subject. The Uncanny Owl Continuing Education Credits plugin offers a way to offer certificates for completing combinations of courses, and with tools like GamiPress, BadgeOS and Uncanny Automator, you can award badges or other certification rewards to users that complete a series of courses. You could even make users “buy” a certification by having users both complete a series of courses and purchase a certification product. 11. Reinforce training outside of the WordPress site. With automation, it’s easy to integrate the LearnDash courses with other learning interventions. After a set of important lessons, create a recipe with Uncanny Automator to send the learner a summary of what they learned and next steps. With Automator and Zapier, you can even pass training data to HR systems or other apps to deliver related training materials through other platforms used by your learners. 12. Offer more blended learning opportunities. If you offer live events and eLearning courses, why not sync the two together? Perhaps signing up for a live workshop unlocks an eLearning course to help users better prepare for the in-person session. Or offer bundles that reinforce learning across multiple channels for better engagement. 13. Keep learning manageable. It’s easy for students to feel overwhelmed when they look at a course listing and see a huge list of 30 courses that they need to complete. Instead of throwing everything users have access to at once, as is typical on a LearnDash site, you can use automation to unlock courses and other content only when it’s appropriate to do so. Have the completion of one course unlock the next 2 courses in a learning path, or perhaps reaching key milestones in a course unlocks other resources. 14. Set users up for success. This is a step we see routinely overlooked on LearnDash sites. When users start a course, why not send an introductory email that welcomes users to the course, sets expectations and offers tips for success? Make users feel more comfortable and understand how to get the most from a course to promote better learning outcomes. 15. Make course evaluation automatic—and more meaningful. You probably already have simple post-course evaluations on your site to capture a learner’s immediate (emotional) feedback. But do you measure knowledge transfer and retention? With tools like Uncanny Automator and Zapier, you could use pre and post-tests in a course to automatically pass quiz scores to Google Sheets and automatically compare results and learning as a result of course completion. But you can go further, and with a CRM perhaps trigger timed tests to go out 30 days after course completion to better assess application of learning to the workplace or retention of what students learned in the course. Many of the automation solutions outlined in this article can be added to your LearnDash site in minutes using tools like Uncanny Automator (which was used for all screenshots in this article). The benefits are significant and well worth the modest investment. For users, you can deliver more personalized user experiences, better support, personal learning paths and improved knowledge transfer. For administrators and facilitators, the time and cost savings can’t be understated, so it’s a win-win situation for everyone on your LearnDash site. And the best part is that it’s easy. With Uncanny Automator, create your first recipe in minutes and add dozens of site-enhancing automations in a few hours. Get started now or find our more about how Automator can improve your LearnDash site!